PENCILLERS: Hendry Prasetya, Jonathan Lam, Corin Howell. For my own finicky reasons, I’ve been enjoying BOOM! Studios’ Mighty Morphin Power Rangers series with a strong sense of caution. I’m very wary of how this story about a dystopian alternate reality is going to end. 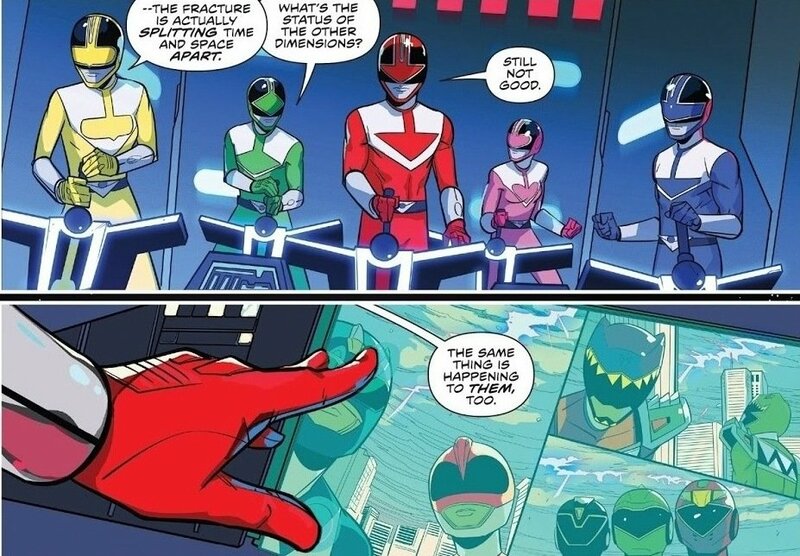 But even with that caution, as a Power Rangers geek it’s impossible to deny the quality of what we see on these pages. 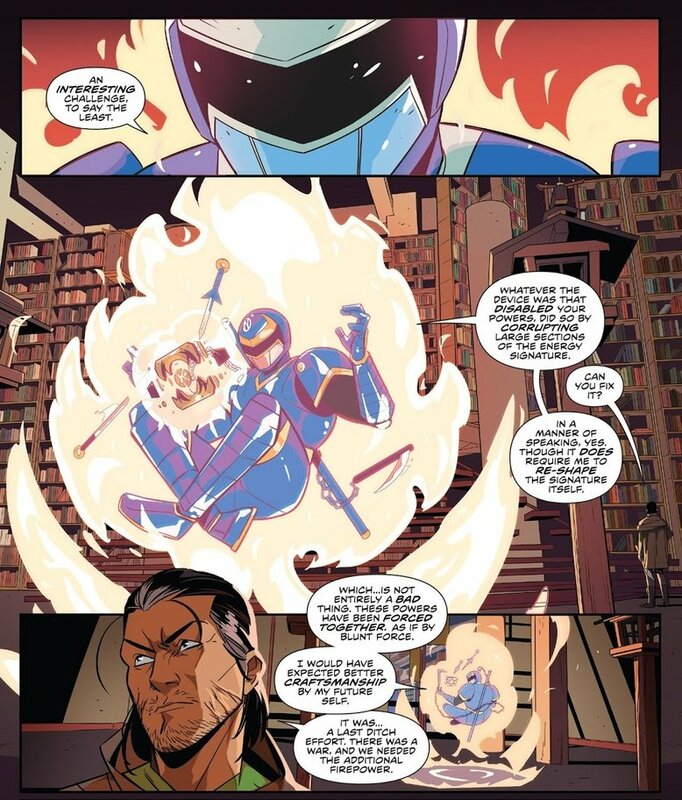 These are easily the best MMPR stories ever seen on the comic book page. Picking up where Vol. 2 left off, the Rangers are as close as they’ve ever been to a doomsday scenario. 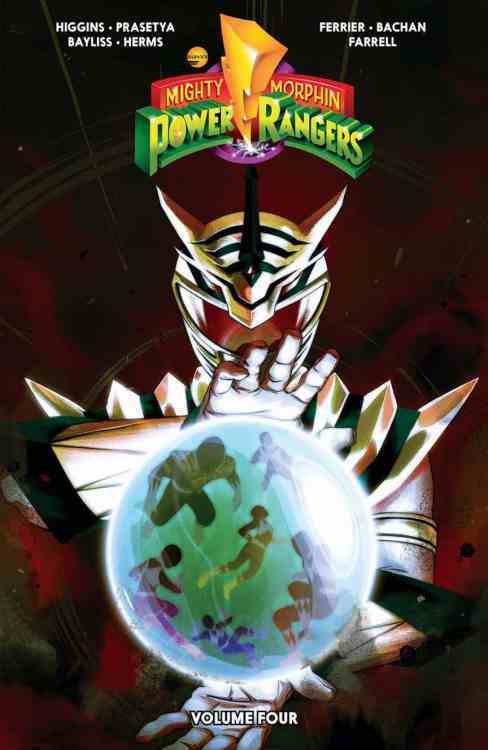 With help from the mysterious Black Dragon, Rita Repulsa has destroyed the Command Center, cut the teens off from both Zordon and their powers, gained control of the zords, and imprisoned Billy in her Dark Dimension. In a last ditch effort, the teens have regained access to the Morphin Grid using Tommy’s Power Coin. In the ensuing battle, Tommy and Billy are transported to an alternate universe. 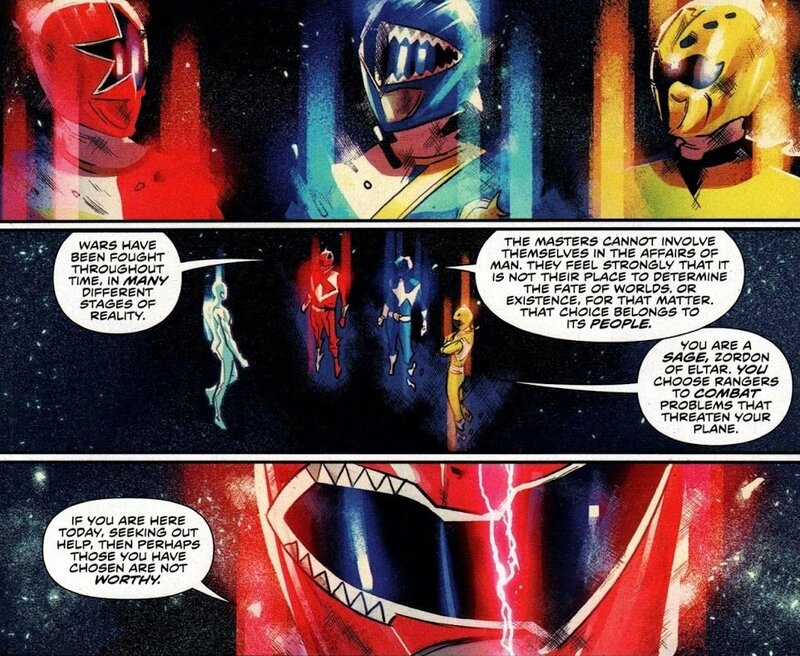 A decimated reality where Tommy did not join Zordon’s team of Rangers. Needless to say, both Tommy and the world at large look very, very different. 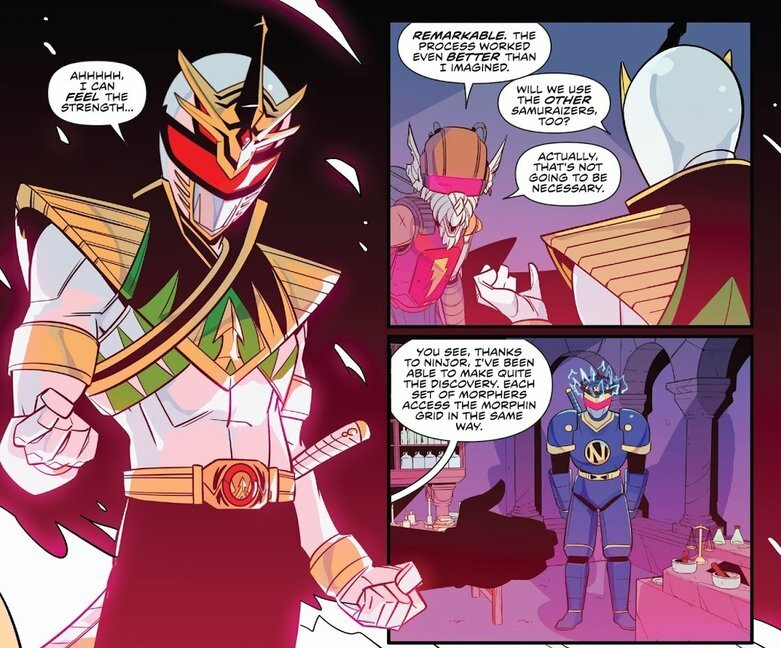 The big moment from issue #9, and perhaps this volume overall, is the introduction of Lord Drakkon. As one might surmise given the costume is an amalgamation of the Green and White Ranger suits, it turns out to be an evil version of Tommy. 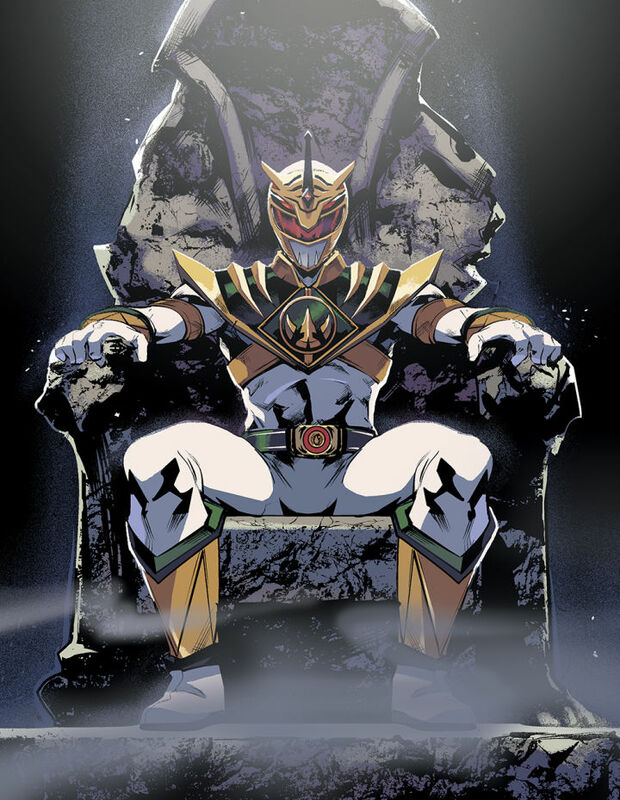 Drakkon’s world is darker than almost anything we’ve ever seen in Power Rangers lore, both literally and thematically. Angel Grove is in ruins, with destroyed zords laying out in the open. Giant statues of Rita and the Green Ranger stand in the city. 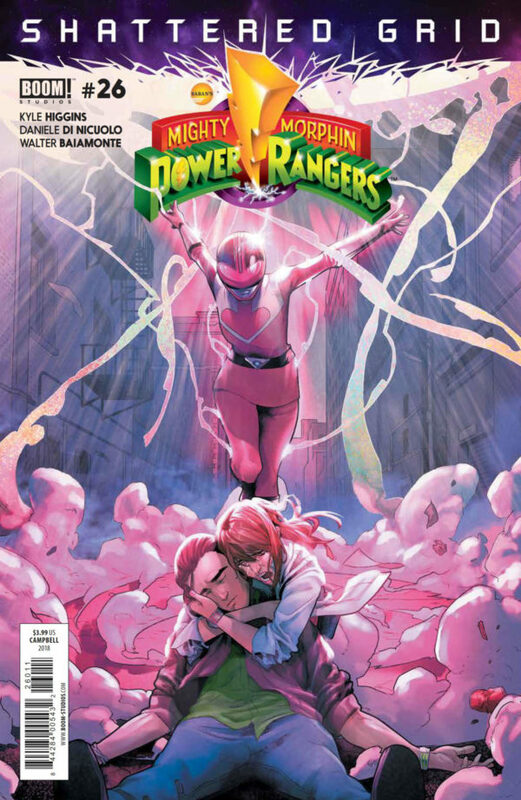 Then in issue #12, one of the Rangers actually dies. It’s off panel, but still a pretty big deal considering this is all based on a kids show. And yet, it’s impactful and it works. 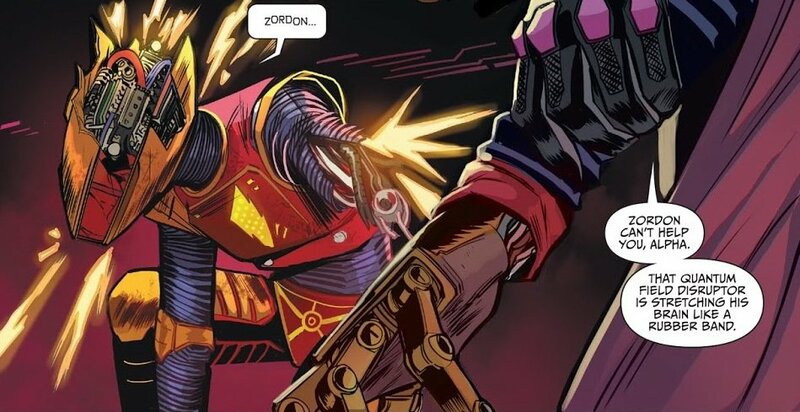 That’s a testament to this team taking the source material more seriously. To the uninitiated, I’m sure it seems silly. 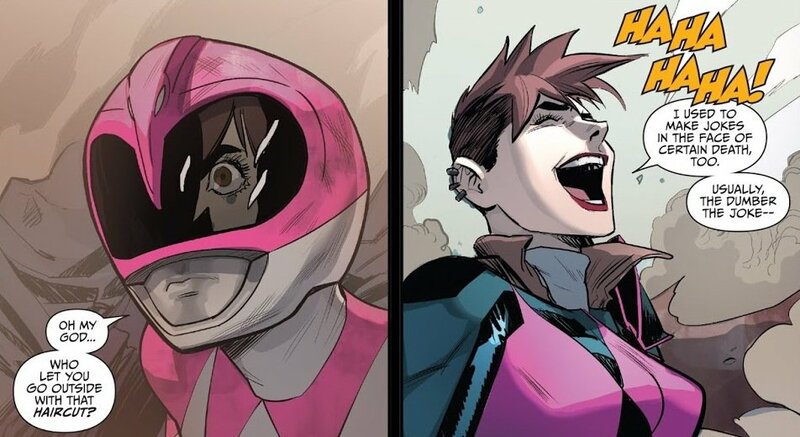 But if you grew up with Power Rangers, and still have a deep affection for it, there’s real value in showing respect to these characters and this world. The proof is in the sales receipts. 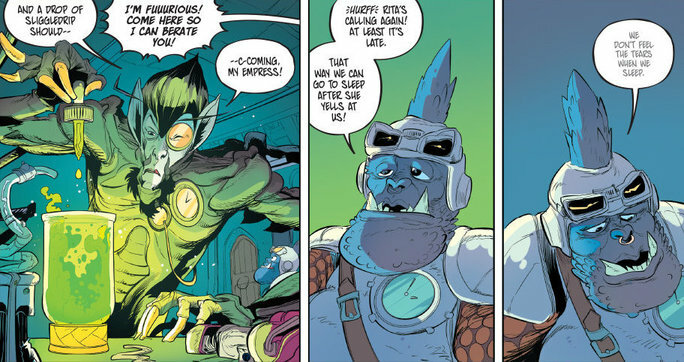 Now we’re getting a second ongoing series and a Justice League team up. Obviously, this story takes place pretty early into Tommy’s run as a Power Ranger, a la season one of the show. But Higgins, Prasetya, and the team go a little wild in this volume, taking advantage of the alternate timeline and throwing in elements from later in the series. 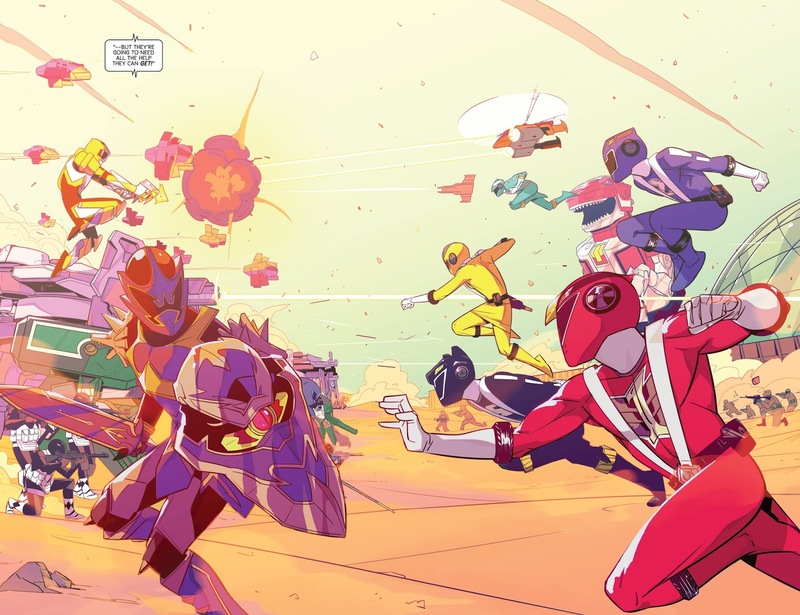 We see Saba, the Thunderzords, the Tigerzord, the Falconzord, and even catch a glimpse of characters like Ninjor and the Phantom Ranger. 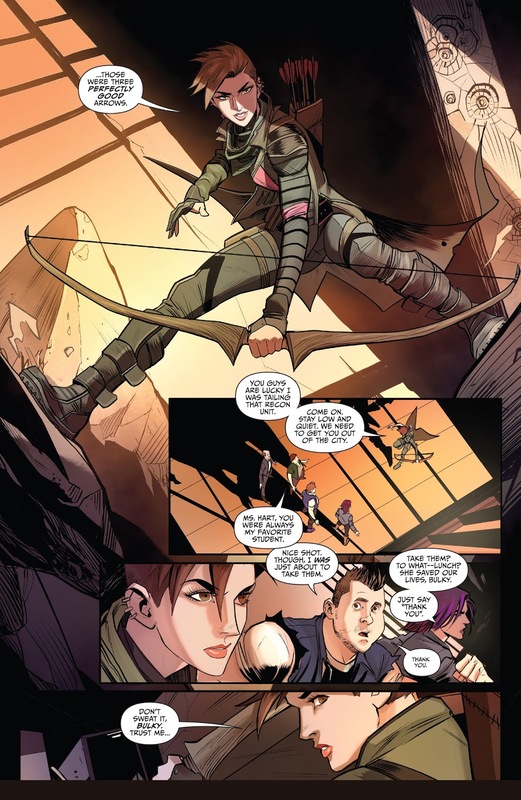 It all looks tremendous, as Prasetya is far more in his element when he’s drawing the superhero action stuff. 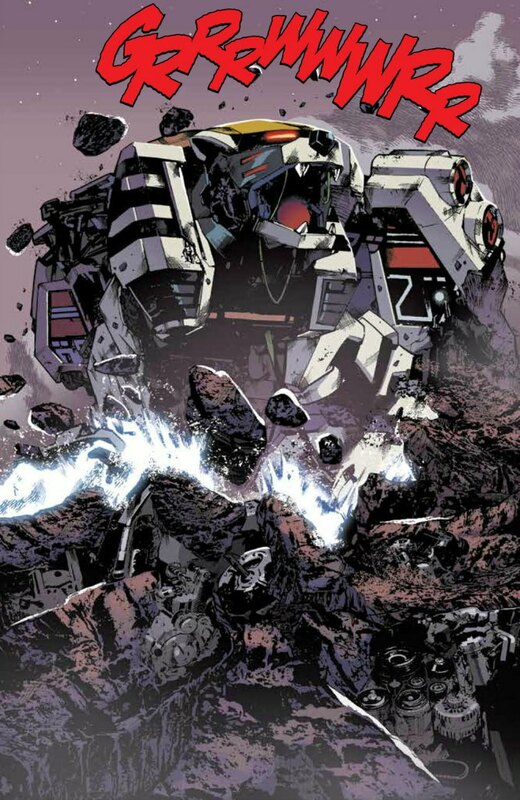 There’s a splash page of the Tigerzord in issue #12 (shown below) that’s particularly morphenomenal. But these future elements are where my caution comes into play. Tommy and Billy are seeing all these things from their future. People have told me I’m being too picky about this, and maybe they’re right. 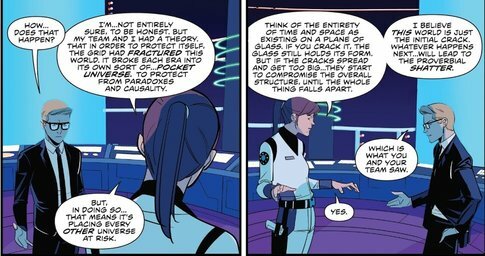 But I stand firm in the idea that from Tommy and Billy’s perspective, seeing things like this taints the impact of events that happen to them later. 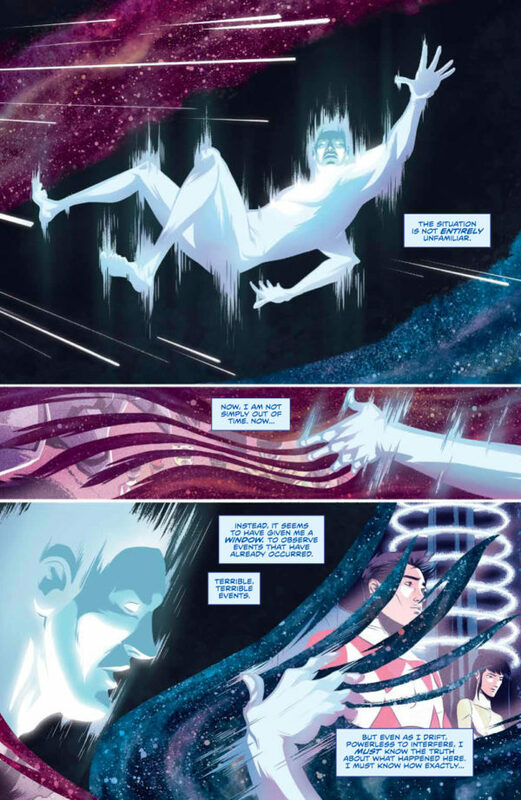 Take the famous sequence in “White Light, Part 2” when Tommy is revealed as the White Ranger, and he’s told he will work alongside Saba and command the Tigerzord. This story implies that he’ll recognize both of them. It’s almost like he’s a kid who snuck a peak at his Christmas presents. He knows what he’s getting, so that moment of genuine surprise and discovery is tainted. I’m hoping a mind wipe is forthcoming for Tommy and Billy. That being said, I take my hat off to Higgins and the BOOM! 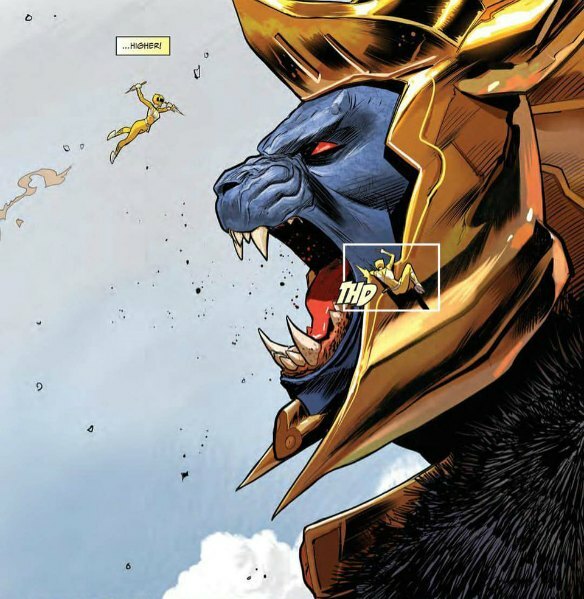 Studios team for caring enough about the Power Rangers universe to incorporate things like this. 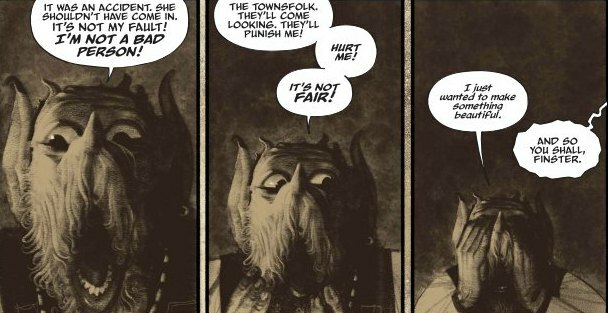 It’s part of why, tainted impact or not, these are the best PR comics ever created. 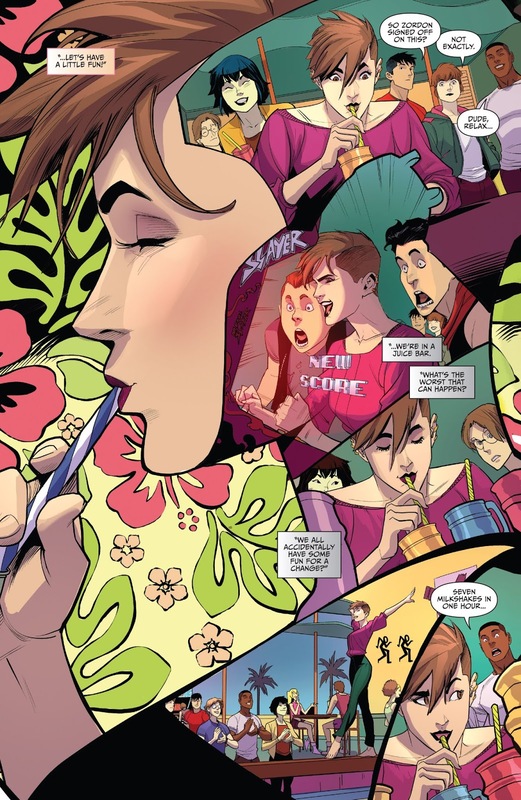 Issue #10 is an interlude focusing on Billy, with Jonathan Lam takes over the pencil, and Joana Lafuente on the colors. It zooms in on Billy’s anxiety and insecurities. It’s a natural direction to take, considering what the character was like on the show. 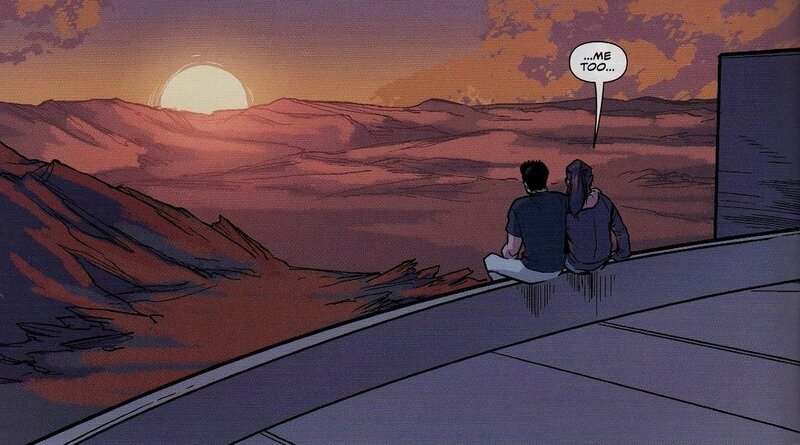 It also serves as a nice follow-up to the scene we saw between Billy and Trini in issue #2. Lam’s pencils are sketchier, and a little more “Americanized” than Prasetya’s. But the transition isn’t as jarring as it might have been with a different artist. 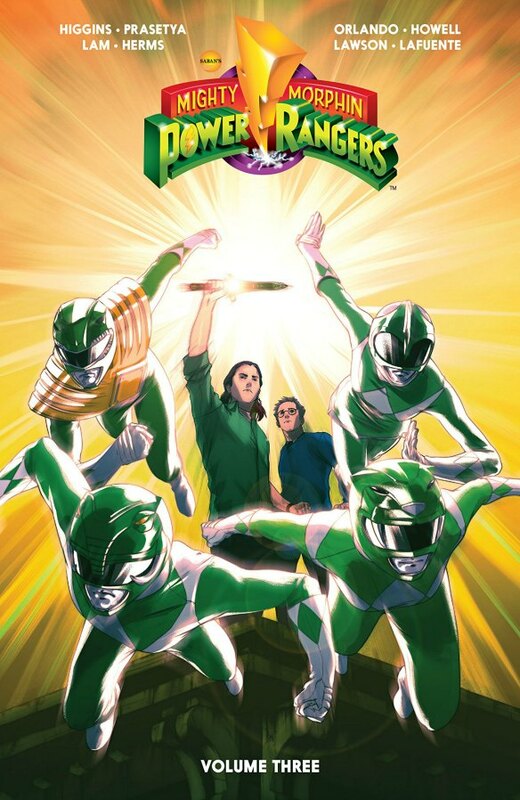 Despite the apprehensions I have about this Mighty Morphin Power Rangers series, which admittedly are a little bit silly, the book is a great testament to the impact the show had on so many of us. Higgins, Prasetya, and everyone working on it has done great justice to it. I’m thankful we have so much more to look forward to. 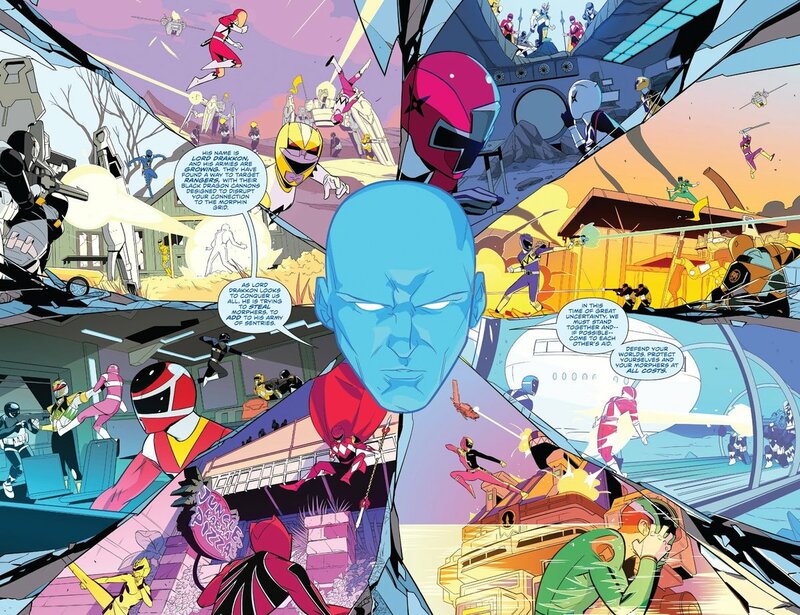 This entry was posted in Comic Books/Graphic Novels and tagged Billy Cranston, Black Ranger, Blue Ranger, BOOM! 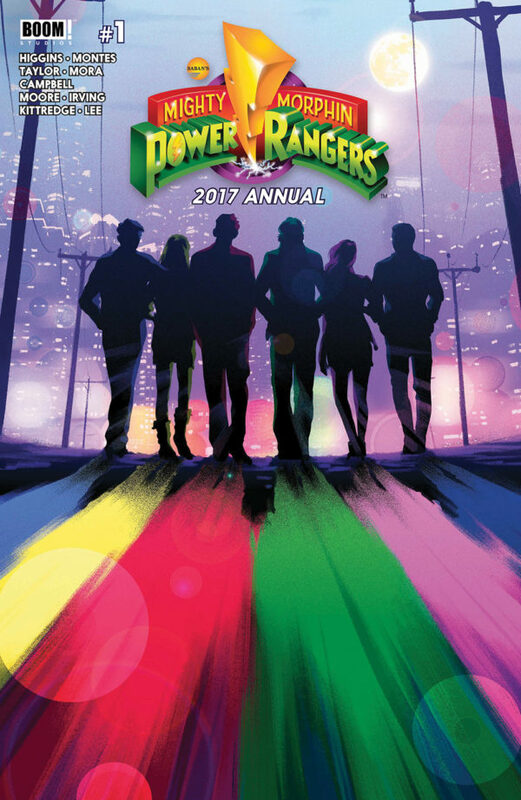 Studios, Bulk & Skull, comic book reviews, graphic novel reviews, graphic novels, Green Ranger, Green With Evil, Lord Drakkon, Mighty Morphin Power Rangers, Mighty Morphin Power Rangers #12 (2017), Mighty Morphin Power Rangers (BOOM! Studios), MMPR, Power Rangers, Red Ranger, Rita Repulsa, Rob Siebert, Tommy Oliver, trade paperback, trade paperback reviews on 06/28/2017 by primaryignition.